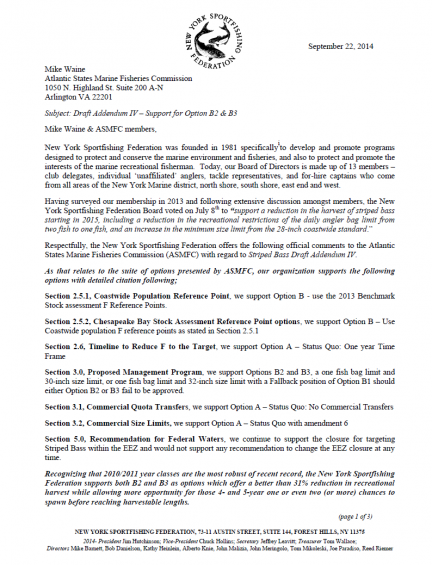 On September 22, 2014, the New York Sportfishing Federation delivered its official position with regard to newly proposed striped bass measures to the Atlantic States Marine Fisheries Commission (ASFMC). Following open discussion with members and an official vote on July 8th, 2014, the Board of Directors officially supported a better than 31% reduction in harvest starting in 2015, offering a position of one fish at greater than 28 inches in minimum size. Following ASFMC presentation of Draft Addendum IV for public comment, the New York Sportfishing Federation officially submitted comments to the ASFMC in support of options B2 and B3, an increase in the overall recreational size limit to 30 or 32 inches respectively. To download full comments, click on the document image below or go to www.nysf.org/wp-content/uploads/2014/09/LetterToASMFC_StripedBass2014.pdf.